The European Database on Medical Devices (Eudamed) is now finally upon us. As per article 6 of the Commission Decision establishing the Eudamed database, EU member states must apply the decision as of 1 May 2011. 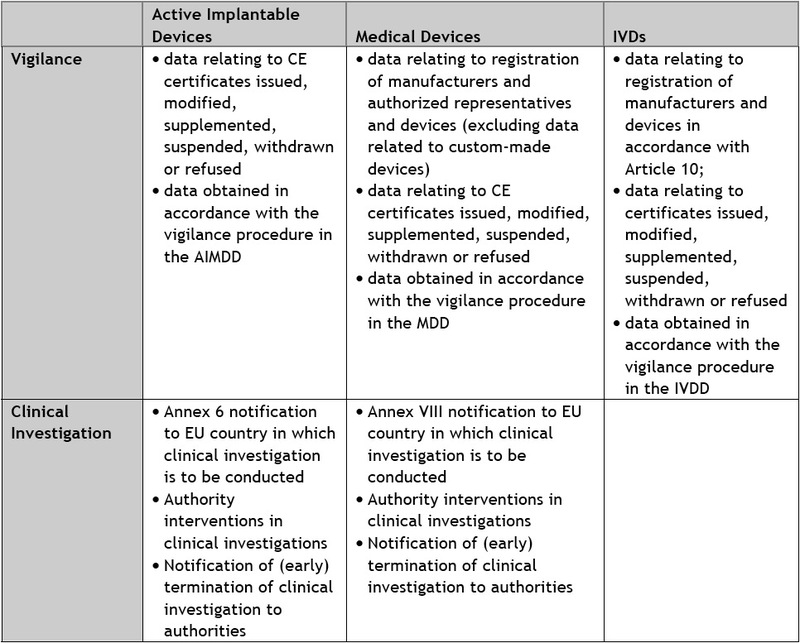 Eudamed becoming operational at last after having been a possibility referred to in the medical devices clearly marks the Commission’s and member states’ commitment to improve market surveillance for medical devices in the EU as a prelude to the impending Recast of the medical devices directives, by making sure that all authorities record and have access to certain market surveillance data. Whether, under what conditions and to what extent other parties, e.g. notified bodies, might have access to that database is still under debate as far as I can determine. What will this entail? The decision obliges them to use the European Database on Medical Devices (Eudamed) to record vigilance and clinical investigation information and to make it accessible by all competent authorities in all EU countries. That means that all parties involved in market surveillance for medical devices in the EU must take int account that information obtained by one member states’ competent authority will immediately be available to all other competent authorities in the EU. Another novelty brought by Eudamed is that it will streamline the rules for manufacturers placing in vitro diagnostic (IVD) devices on the market by eliminating administrative hurdles for manufacturers of IVD devices. At present, they must notify every EU country concerned separately when placing certain IVD devices on the market, as required under article 10 of the IVD Directive. 1 May 2011 marks the end of the transitional period in article 10 (6) IVD Directive, as has been confirmed by the European Commission, so Eudamed allows streamlined registration by enabling entry of one notification in Eudamed. it’s a good news of course, but what about the already notified products if they were not notified in all the european countries? Hi, thanks for the comment and apologies for the delay in answering your comment. The existing notfications would be data already existing, which needs to be entered into Eudamed at 30 April 2012 at the latest. As of 1 May 2011 the transitional regime of article 10 IVD directive ended automatically, without transitional period or other transitional arrangements beinng necessary. My conclusion is that the existing notifications (those from before 1 May 2011) will get the status of single Eudamed notification for the devices concerned. Hi Mirette, I agree that it would be very convenient for companies to have access to EUDAMED as well. However, I have it on good authoritiy (from the responsible persons at the European Commission) that EUDAMED will be more public relatively soon (2012). Private parties will not be able to access all fields that authorities and notified bodies have access to and it is not entirely clear yet to what fields exactly they will have access. I wiill write about this though as soon as I have enough information to warrant an article on my blog. Has there been any update on whether EUDAMED has become more publicly accessible? Also if it is how do you get to it? I can’t seem to find any links. Hi Ryan, EUDAMED is not publicly accessible currently. This will likely change in the new medical devices regulations in the pipeline, which contain provisions to that effect. The exact degree of access is still subject to various amendments. Dear George, presently only EU competent authorities have access to Eudamed, but I know that there are plans to open up parts of Eudamed to the general public (see my reply to other comments below). If the Egyptian authorities would like more fargoing access than public access, they should conclude an agreement with the European Commission directly.